How to easily start taking advantage of the largest network on earth. Without question, Facebook is the big fish in the social media world with 1.86B users as of December 2016. That’s more than 25% of the world’s population. Because of it’s sheer reach, most companies should focus their social marketing, promotion and advertising efforts on Facebook, first and foremost. Many do. Sixty million companies have an active business page. Many businesses post more than once per day. Unfortunately, all this activity also makes it real noisy. How do you make sure your brand is standing out and your content is earning you clicks, leads and ultimately revenue? Progress at anything is about getting up each day and consistently performing the task. Getting marketing results from Facebook is no different. You might get lucky and have a day or a week where you get sudden surges in likes or new followers. And you should use the analytics data Facebook provides to try to duplicate the spikes. But, the key to getting better Facebook results is consistent publishing. This is perhaps the most famous quote from one of the most famous management consultants, educators and authors, Peter Drucker. First published decades ago, t’s still relevant, if not more so. Drucker probably never dreamed of a world where we’d be able to instantly launch marketing campaigns, let alone see the results of our marketing efforts right away too. But, with Facebook, like almost all online marketing, results can be instant. They also can improve over time. This makes real time or near real-time monitoring important. 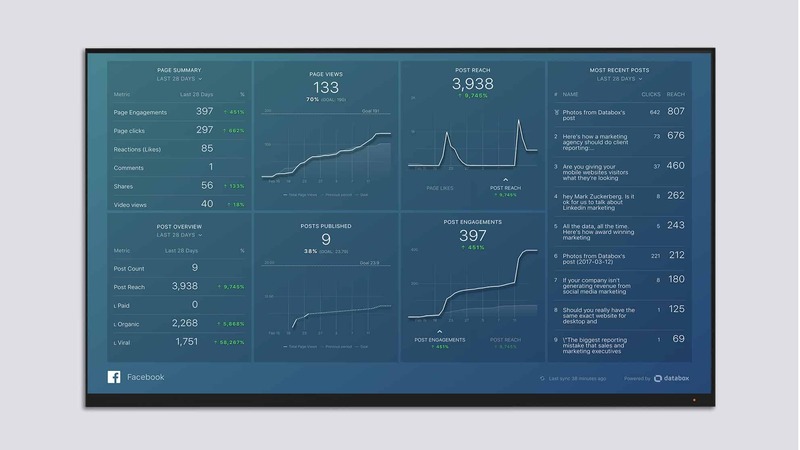 Below is a Databox-powered dashboard that shows all of the key metrics you should track. From page engagement metrics to post performance, as well as paid, organic and viral results, it shows your current results against historical performance. Databox users quickly scan for red, down arrows to see where improvement is necessary. They can even set goals and track progress to them if you’d like, like we are doing on the charts that show number of page views and posts published. Once you begin posting regularly, it’s important to monitor the impact of your efforts. But, what should you monitor? Facebook provides a large number of metrics for measuring your overall progress. Too many, in my opinion. Likes: People who have clicked “like” on your page, essentially opting in to your page updates. Reach: The total number of Facebook users who were shown your page and posts. Engagement: This is an unique measure of the amount of people who “engaged” with your page, with the term engagement referring primarily to likes, comments, shares, and clicks on the post. Likes and reach are often referred to as “vanity metrics” or “brand awareness metrics” because they are so far up-funnel. Of the three metrics above, engagement gives you the best feel for whether your content is appealing to your followers or not. As we’ve already covered, posting updates consistently is the key activity that will drive results from your Facebook page. There are scores of best practices already published, so I won’t rehash them all here. Facebook has their own best practices for business pages, and numerous third-party sites have recommendations for Facebook page best practices, including great lists from PostPlanner and Moz. My advice is to simply share the content you’re already producing. By sharing links to content you’ve published on your website, you’ll get Facebook followers to your site, where they stand a better chance of learning about you and converting into a lead or sale. Educational content they’ll find relevant. Ask industry-specific questions or share surveys. Quick updates about your business they’ll find interesting. Whatever you do, don’t automate it completely. Pushing out the same posts repetitively on a pre-determined schedule won’t drive clicks and engagements. It used to work really well. And as a result, there are scores of software systems that do this. But if you’re going to succumb to this laziness, make sure you’re monitoring your click/engagement metrics and consider adjusting your strategy if you’re getting diminishing returns. No matter how you’re posting, make sure you’re actually responding to people who engage with you. If people are leaving comments or asking questions, make sure you’re conversing back and forth with them. What you really want to happen is for others to engage with your posts on their own: clicking, commenting and sharing. Some posts will perform way better than others in these regards. So, monitor the engagement each post is getting. For example, in the datablock on the right which shows Databox’s Facebook page data, you’ll see that our post titled, “Here’s is how a marketing agency should do client reporting” resulted in 73 clicks. You can be sure we’ll be posting more on that topic. Facebook is the greatest targeted marketing platform ever created. If you are spending money on Facebook ads, you can target by many variables. Facebook also gives you the ability to see some basic demographics of the people who are visiting your page. A few demographics that everyone should track are: age, gender and geography. It’s great to have tens of thousands of fans, or even into the millions. But if those fans are outside of your target market or not the right age or gender, it will have little to no impact on your business. If, on the other hand, you can do business anywhere, Facebook can also be a path to generating revenue globally. Often, marketers will make assumptions that the bulk of their Facebook fandom comes from their country of business. While this is often true, you can find surprising patterns here — such as thousands of fans from Spain, where your product or service isn’t even available. Would that signal a potential entry into Spain? Maybe. Based on my experience, most Facebook fan gender breakdowns are skewed a bit in one direction, but if you have an inordinate amount of one gender and your content isn’t gender-specific (i.e. a men’s magazine), then you need to consider why that gender gap exists and how you can create posts that better resonate with the other half. The desired conversions for your business will depend on your business model. If you’re running an ecommerce store, you’ll want sales. If you’re running a local store, you might want phone calls and visits. If you’re running a company that sells to other businesses, leads and offline-salespeople-enabled sales might be your desired outcome. With the right software and strategy, all of those can be tracked. For local businesses, Facebook has some great built-in capabilities. You can create call-to-action buttons for specific things like your phone number listing, directions to your location or a click to your website. These buttons reside on the right-hand side of your page under your cover photo and above your page information. For online commerce sites, add a “shop now” button. For companies that want to generate leads, it makes sense to put a button so visitors can sign up for your email newsletter, although there are many different facebook call-to-action button options. But, just knowing how many times these items were clicked doesn’t give you a true ROI measurement since many of your site visitors could get distracted before doing business with you. So, it’s important to use Google Analytics to track goals or use software like HubSpot to track lead or ecommerce conversions. Facebook is perhaps the best gift marketers have ever been given. No other platform rivals the ease of which an audience can be built, a community can be fostered and attention can be garnered. Follow the six step process above to get started and continuously improve the results your company gets.